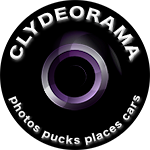 Unless indicated otherwise, all photographs displayed on the Clydeorama.com website are © Copyright Clyde Caplan. These works by Clyde Caplan are licensed under a Creative Commons Attribution-NonCommercial 3.0 License. Attribution should be given to Clyde Caplan and/or clydeorama.com. Thank you for your help! If you have questions, please contact me!